On October 1, 1976, Jon Pellegrin (6th OPM), the then 32-year-old vice president of Wisconsin's Johnson Hill Press, walked solemnly into his father George's office. It was time. Slumping into the chair opposite his father's desk, he took a deep breath and said, "Dad, this is your company, and you're the president, but our differences about how to run it are getting bigger, and our relationship is deteriorating quickly. I think the best thing is for me to leave." The elder Pellegrin, 58 years old, was momentarily stunned. His mind flashed back over the past two decades of hard work during which he, and, for the last eight years, his son, had grown the business into a thriving magazine, book, and commercial publishing company. "Jonathan, this is not how I wanted things to work out," he said slowly. "I respect your abilities, but I don't know if I'm ready to step down and give you the top job." Jon and George Pellegrin were grappling with issues common to any company: managerial differences, power clashes, succession questions. But ratcheting up the intensity of their struggle was the fact that they were not just talking manager to manager. They were also engaged in conflict as father and son, bringing to the table all the tensions, expectations, and disappointments that had built up between them over a lifetime. The Pellegrin drama, the topic of a 1998 HBS case study, illustrates that the family company, given its multilayered complexity, is not your typical business organization. It's a different species and one that, according to HBS senior lecturer John A. Davis, has only been formally studied by business schools in the last twenty years. That may not seem so remarkable until you realize that "family businesses" include not just the mom-and-pop store on the corner but also the likes of multibillion-dollar corporations such as Wal-Mart and Cargill. "In fact," says Davis, "more than two-thirds of all business enterprises worldwide are owned or managed by families, and 30 percent of the Fortune 500 companies are family owned or controlled." In Generation to Generation: Life Cycles of the Family Business, Davis and coauthors Kelin E. Gersick, Marion McCollom Hampton, and Ivan Lansberg go so far as to assert that having a successful family business is the "Emerald City" for most of the world's population-that is, the much sought-after means of assuring security and the promise of economic advancement for present and future generations. Given the importance of family-owned and -operated enterprises to the international economy, HBS has long been on the forefront of research in this field. Among the early pioneers were HBS professors emeriti Renato Tagiuri and Louis B. Barnes, who in the 1970s began to develop conceptual frameworks to help make sense of family-business dynamics. The School has made further strides in the past six years with courses, cases, and conferences designed to explore the frustrating yet fascinating dynamics that make family businesses among the most powerful and influential organizations in the world (the New York Times Company, for example)-and also the most vulnerable (witness Canada's Steinberg's grocery store chain, which succumbed to family infighting). Howard H. Stevenson, HBS's Sarofim-Rock Professor of Business Administration and an expert in entrepreneurship who is helping lead the School's research efforts in the family business field, comments, "We hope to learn much more about family companies and in turn provide them with insights that will strengthen their capacity to manage themselves well." John Davis, who has been investigating family businesses since he was a doctoral student at HBS in the late 1970s, has taken the School's work in this field to a new level. In his research over the past two decades, Davis has discovered that the issues family-run enterprises encounter do not vary much from one country to the next-from decisions regarding governance, succession, and the distribution of wealth, to the effects that life events such as births and deaths, marriages and divorces, and hirings and retirements have on a business. Davis and his Generation to Generation coauthors have also developed a powerful framework that is helping managers of family enterprises tease out how the distinct but related spheres of ownership, family, and business overlap, influence one another, and evolve over time (see sidebar). "Most family businesses start with a single controlling owner," Davis explains. "Fifteen years down the line, that owner might start thinking about bringing the children into the company. Eventually, in-laws and cousins may find themselves working together and trying to manage an intricate set of relationships as the organization expands and formalizes processes that were hit-or-miss during the company's early days as a startup." Given the managerial complexity involved, only about one-third of family enterprises survive in the same family's hands from the first to the second generation, he notes. For the second year in a row, Davis is teaching a new MBA elective, Management of the Family Business, which he cotaught last year with Barnes. The course explores family companies from managerial, psychological, and financial angles. 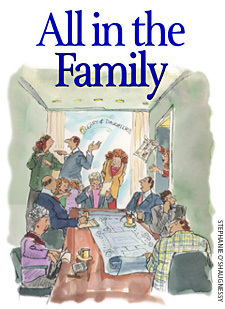 Topics range from "entrepreneurial management styles," to "birth order dynamics," to "women's issues in the family firm." "What's important is that students come away with a good sense of how human relations play into these complicated organizations, which is as critical as understanding the purely managerial issues involved-if not more so," he notes. Similarly, Davis, Barnes, and Stevenson are teaching a new Executive Education program, Families in Business: From Generation to Generation. For the past two Novembers, this five-day course has brought to Soldiers Field family teams of two to eight members from a wide range of businesses around the world to explore state-of-the-art knowledge about family-run companies. "The program provided many key insights, like how important it is to have good communication among family members when running a business," notes Michael L. Carricarte, president of Miami-based Amedex Insurance Group, who attended the program in 1997. "As a result, my family planned several retreats that proved very valuable to the functioning of our firm." Most recently, the School has gone global with its family business initiative. In Latin America, HBS has teamed up with Chile's Universidad Adolfo Ibáñez to offer a version of the Executive Education program titled "Perpetuating the Successful Family Company." Piloted in 1997, the program is now offered in Chile and Brazil and is taught by both HBS and Adolfo Ibáñez faculty. A similar joint program will be offered in Hong Kong by 2000. "Family enterprises are the dominant business form outside the most developed countries, as well as in many highly developed countries, such as Sweden," says Stevenson in explaining HBS's interest in establishing such programs abroad. "Recent research at the School, particularly by Professor Krishna G. Palepu and Associate Professor Tarun Khanna, has shed light on the reasons for this, as the family enterprise im-proves the efficiency of labor, capital, and product markets where they don't yet exist in a well-developed form." In addition, this September the School will host a symposium titled "Successful Business Families," which will convene HBS alumni involved in family businesses for three days of discussion with faculty on what it takes both to be successful in business and to raise children who can succeed, whether in business or in other fields. The symposium will advance the dialogue that was begun at the "Family Enterprise Symposium," held at the School in 1992. "These courses and symposia provide wonderful opportunities for us both to learn what's going on worldwide with family businesses and to disseminate that knowledge," says Davis. "The School intends to be an international leader in teaching and research on family companies." At the following links, four HBS alumni—Kathy Barco, Philippe de Gaspé Beaubien, Earl Graves, and Kenzaburo Mogi—talk about running their own successful family companies. HBS professor emeritus Renato Tagiuri and senior lecturer John Davis have developed a useful tool for understanding the source of conflicts and priorities in family firms. Their model describes the family business system as three independent but overlapping subsystems: business, ownership, and family. Any individual in a family business system falls in one of the seven sectors created by the three circles. It is tempting to attribute disagreements in family business systems to personality conflicts, and indeed personality can be a factor. But, more often, an individual's role in the system is a more fundamental reason for conflict. In questions of dividend policy, for example, someone in sector four (a family member who is an owner but not an employee) may want to increase dividends to achieve a reasonable return on his or her investment as an owner, while someone in sector six(a family member who is not an owner but is an employee) may want to suspend dividends in order to reinvest in business expansion, which might create better career advancement opportunities. The two might be siblings, who can't understand why they don't agree on this question. The model helps everyone see how organizational roles can color the players' points of view on key decisions.